There are any number of reasons why older artists are usually neglected by art museums. However, James Martin, now 90 and exhibiting 81 gouaches on paper covering five decades, gets top-flight treatment from his gallery dealer. His last art museum survey was in 2001. Falling between too many cracks to attract younger curators or critics, Martin’s bizarre personality has also put people off; he’s a wag, a wit, a satirist, all of which comes out in his hilarious tableaux of famous artists, writers and pop-culture figures capering about in the pictures, usually accompanied by one of the artist’s numerous personae: a lion, a sailor, a bum or an aesthete. 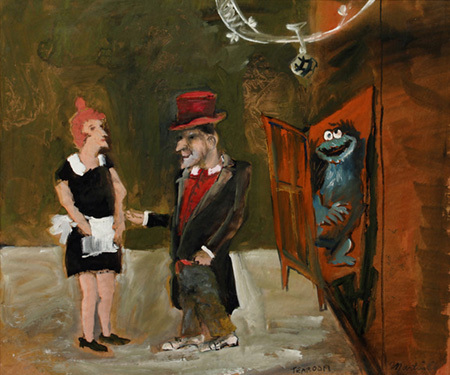 “Seattle Times” art critic Sheila Farr codified Martin’s wayward career in her 2001 book, “Art Rustler at the Rivoli,” chronicling his journey from promising English literature student at the University of Washington (BA, 1953) to his not-so-isolated storefront studio in the Seattle suburb of Edmonds. Viewers need not know the details of the artist’s tempestuous life, but may appreciate the paintings’ zany mixture of panic-stricken animals and frazzled people. All are relentlessly caught in vignettes that are wildly implausible, but function convincingly within Martin’s self-contained universe. The salient take-away from this survey is that Martin’s cultural purview is much wider than has been understood. While earlier work ensconced Marcel Proust, Chagall, Degas, Stravinsky and Picasso (a lifelong obsession), work of the past three decades addresses and “competes” with Barbara Walters (interviewing an eggplant), Andy Warhol (as Wagner’s Siegfried), Charles Lindbergh and the Lone Ranger, not to mention Frida Kahlo and Toulouse-Lautrec. Each crowded narrative retains its enigmatic, ambiguous character, emitting delirious colors, surrealistic juxtapositions, and, one suspects, highly subjective meditations on much of 20th-century art and culture.